Like I said in my last post, I will use these as a filler when I don't have anything to show for any of my other PC projects. Today's card is another one from back when I was just getting into collecting and Red Wings were all that mattered to me. As you can see from the title, this one features former defenseman Paul Coffey. It's always weird thinking of him as a Red Wing, but that's all I knew when I started watching the Wings on TV during his time with the team. Coffey spent four seasons with the Wings before being traded to Hartford along with Keith Primeau for Brendan Shanahan. This one is from the 1995-96 Topps set and part of the Marquee Men subset. I remember getting a ton of these things as a kid and I thought they were the coolest thing for some reason. It's a fairly simple design, but these cards are hard to miss when sorting through a box of 90's junk. Definitely one of my favorites from the mid 90's. There were also some really cool "Power Booster" versions of these cards, one of which can be seen by clicking here. These were pretty hard to come by if I remember correctly. I think between a couple of boxes of 1995-96 Topps, I only have one or two. 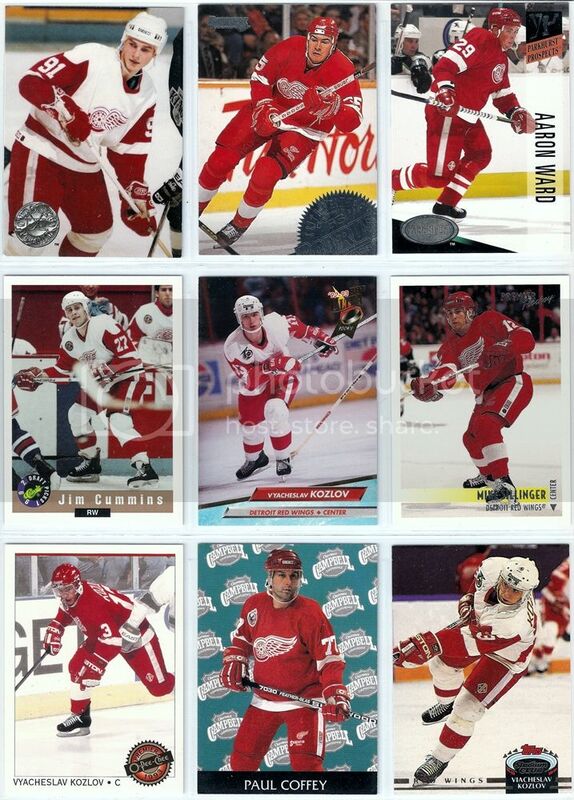 I thought I would start another mini-series of posts here on Card Boarded focusing on my personal collection of Detroit Red Wings cards. The idea for this series will be to show off any random Red Wings card or cards when I have nothing else to write about. This will help fill the void when I go days or weeks between PC pickups. These, unlike anything I would post in the "My Picks" series of posts, do not necessarily need to have a cool picture or design. This will be more about just showing off cards I have of the team I've followed since I was about 8 years old. 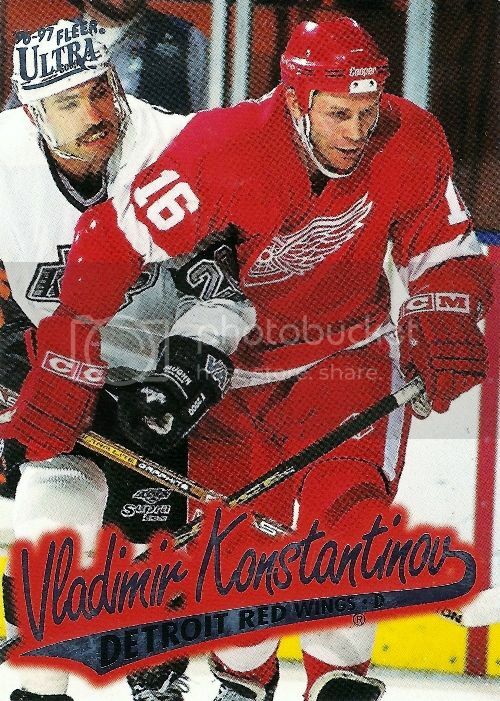 Not sure where this will take me, but let's get things started with former Wings defenseman Vladimir Konstantinov. This card comes from the 1996-97 Fleer Ultra set. I chose this one because this is one of the sets I distinctly remember collecting as a kid. There was just something I really liked about the font of the player's name and the team color blur effect surrounding the text. This was also from a time when I didn't care about the value of my cards or getting any of the "hits" as much as just the fact it was another Wings card for my collection. Those were the days. What do you think of this idea, would you be interested in seeing more of my Red Wings randomness in another series here on Card Boarded? Normally people will put things like HSHS points or any other kind of decoy/giveaway card in packages to help protect the purchased goods. That's fairly common and not out of the ordinary. This was a bit more unexpected if you ask me. As far as how I feel about base cards, I think they're an important part of collecting and I will always have a place for them in my collection. Especially as a player collector, they give me something relatively cheap and easy to find across a broad range of products each and every year. That can't be said for the "hits" that a lot of the time get out of my price range. What are your thoughts on base cards? And have you ever seen them used like this? In my last post I showed off a couple of cool new Jimmy Howard cards I got via trade from Michael over at Collecting for Kicks. Those two I was expecting, but in addition to them he was kind enough to send me a few extra Wings cards. The best part about this, other than them getting tossed in as extras, was that I did not already have a single one of the cards in my collection. Here's a look at nine of them. It's definitely a nice mix here. 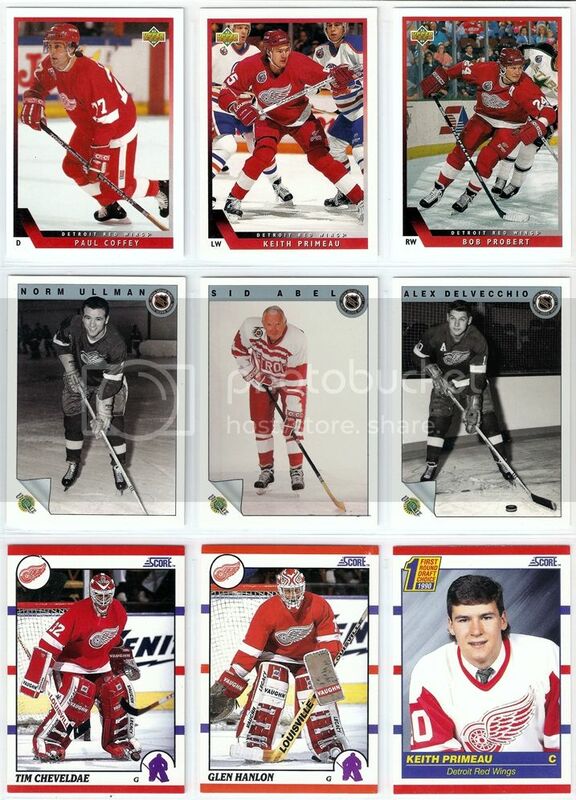 I really like the Osgood McDonald's card as well as the Gordie Howe from the NHCD set.Those are cool because they're not something I can easily get here in the States without resorting to eBay or other sources. 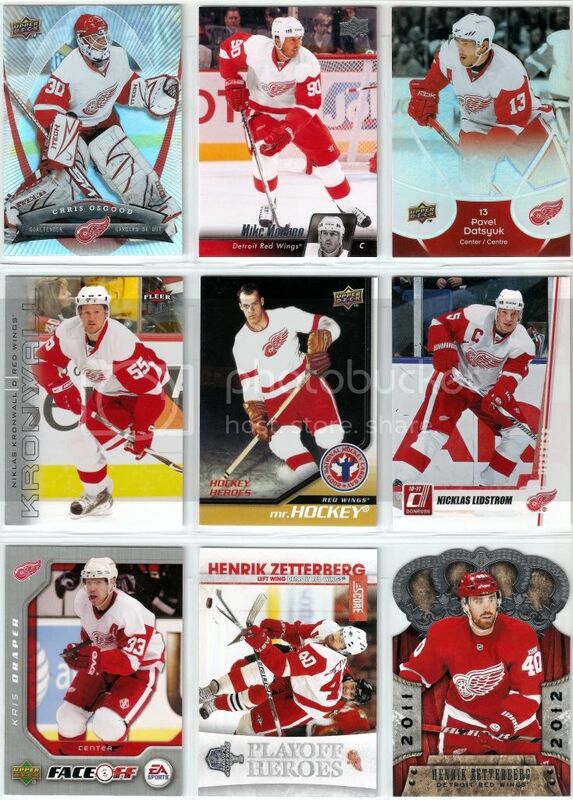 Seeing the nice mix of players got me thinking: how should I go about organizing my Red Wings collection? Right now it's done by set in chronological order, but I've been thinking about sorting by player instead. What do you guys do with your team collections? One of the things I like about this hobby is getting to trade with fellow collectors. It's a good feeling when you know both sides of the deal benefited by getting rid of something they didn't want or need and coming away with something of interest. That said, I have another trade post to share, this time thanks to Michael over at Collecting for Kicks. We had been going back and forth for a while on a deal that would send some Canucks cards his way and some Howard cards my way. Well, my end of the deal arrived in the mail the other day and I have two new additions to the Howard collection to show off. The first was this base card from 2012-13 Score. It's the first card I've gotten for the new season and its got an excellent picture of Jimmy on the front. Other than that, the design of the card is pretty nice, other than the completely pointless "western conference" text at the bottom. I mean seriously, what was Panini thinking there? The second was this Pop Ups insert card from 2012-13 OPC. These are at least something different, although I wish they would actually pop up if that's what they are going to call them, am I right? Other than that I really like the retro look of these cards. These may not be the most valuable cards in the world, but they are just as important to me as any other Howard card in the collection. Also on the plus side, these give me a start on the 2012-13 collecting season, and the best part is, they only cost me a few bucks for shipping off some cards I no longer needed. Thanks again Michael! When it comes to my current collection, this is probably the only project where I don't mind spending a bit more than I want to every now and then. That's simply because of how rare these things are on the secondary market. They're almost impossible to find these days. I mean look how long it's taken me just to get even near 40 of them. Sometimes I get lucky and find them for just a few bucks or even as low as $1, but there have been a few occasions where the bidding got a bit intense and ended considerably higher. A good example was the Brian Boucher that set me back almost $30. The latest one, this Nikolai Antropov shown below, ended up costing me a lot more than I thought it would, just like the Boucher. The winning bid ended up being $28, but hey when I think this is my only shot at this card ever, I had to go for it. Not really sure if this card warrants that kind of price, but I guess its really a crapshoot when it comes to sets like this, am I right? I'm sure I was either up against another set builder or an Antropov collector for it to get this high. I'm just glad I came away with it. This one brings the Super Script total to 38 out of 220. That's just over 17% of the entire set. On the plus side, this helps keep up the pace on this set for 2012. This will be the 16th of the year, which is better than one per month so far. I believe I mentioned this in some of my previous Howard show and tell posts, but I've only really been on the lookout for stuff that I would consider to be a "steal" on eBay. Sometimes that means getting a card with just a single bid of $0.99, while other times like here I just couldn't resist based on the final price of the auction. As you can tell by the title above, this one is from the 2010-11 Zenith set from Panini. In that set there were "red hot" and "white hot" parallels. The reds were non-serial numbered and the whites were numbered to just 25 copies. Obviously, I have the white now, but the surprising thing was the auction ending at just $1.55 before shipping. While this thing does not scan well at all, it's a pretty sweet looking card. The only bad thing about it is a slight ding in the lower left hand corner, but I won't complain because this thing only cost me a few bucks and is numbered 20/25. On the plus side, this is only like the third one of these I've seen pop up on eBay since this set came out. I was hoping to get a few things in the mail to show off here yesterday, but none of them showed up, so I today I've got another new trio of cards for this project. They all have one thing in common, and that would be the only real mismatch is their mask. 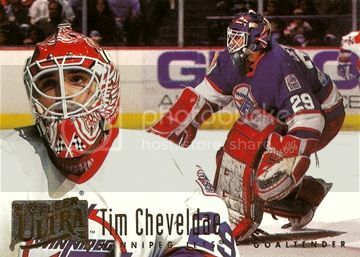 The first one features former Red Wings goaltender Tim Cheveldae pictured with the real Winnipeg Jets during the mid 90's. 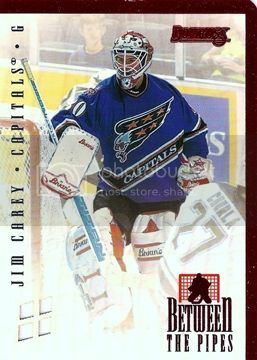 He was traded from Detroit in 1993-94 with Chris Osgood taking over as the number one goalie. You can see here that he played in his Wings mask with the Jets for a while. A pretty obvious mismatch, right? 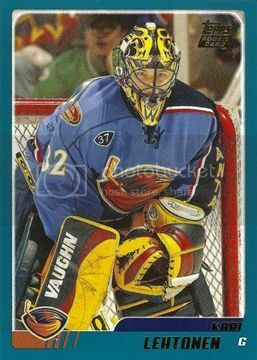 The next one is a bit newer and features former Avalanche goaltender David Aebischer. 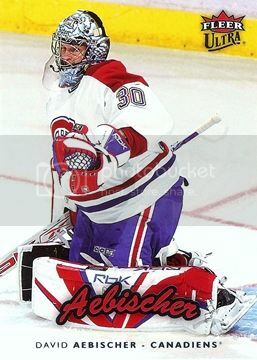 He is pictured here with the Montreal Canadiens after he was swapped for Jose Theodore just a day before the trade deadline in 2005-06. It looks like the last piece of equipment to make the adjustment was his mask, as the rest are all in Habs colors. Then there is this one from all the way back in 1992. 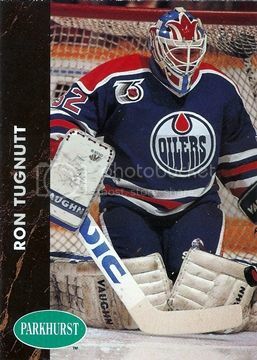 It features former goaltender Ron Tugnutt shown with the Edmonton Oilers. While his plain white pads don't tell us much, his red white and blue mask is a different story. That's because it's from his time with the Quebec Nordiques. Click here to see this mask in action with Quebec. That's it for now. I am hoping that I will get a couple of bubble mailers tomorrow that will give me a few cool thins to show off. If not, maybe I will jump back into this series as I do have a nice little stack of great candidates waiting to be scanned. It's been a while since I've been able to get another one of these into the queue, but now that I have, it feels nice to change things up a bit again as far as content goes on here. When it comes to collecting and hockey in general, I have one favorite team and that will always be the Detroit Red Wings. However, when it comes to jerseys, while I have plenty from the Wings, I have several other favorite teams, one of which is the Atlanta Thrashers. When the franchise was established, I immediately loved the new logo that came with the team. Once I saw their original jerseys for the first time, I knew I have a new favorite. 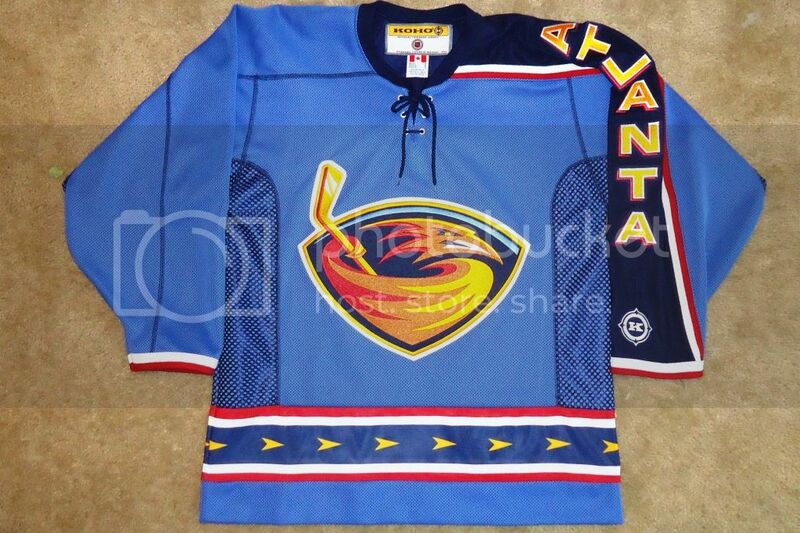 Fast forward a couple of years and the Thrashers jumped on the third jersey bandwagon and came up with their own. When the new third jersey was unveiled, I loved it. Since then I had always wanted one and was lucky enough to find one on eBay for $25 delivered about a month ago. Bought it as a birthday present to myself. The first thing I always notice about this one is the lack of symmetry, something that is not all that common with NHL jerseys. I like that, because it sets this apart from the rest. 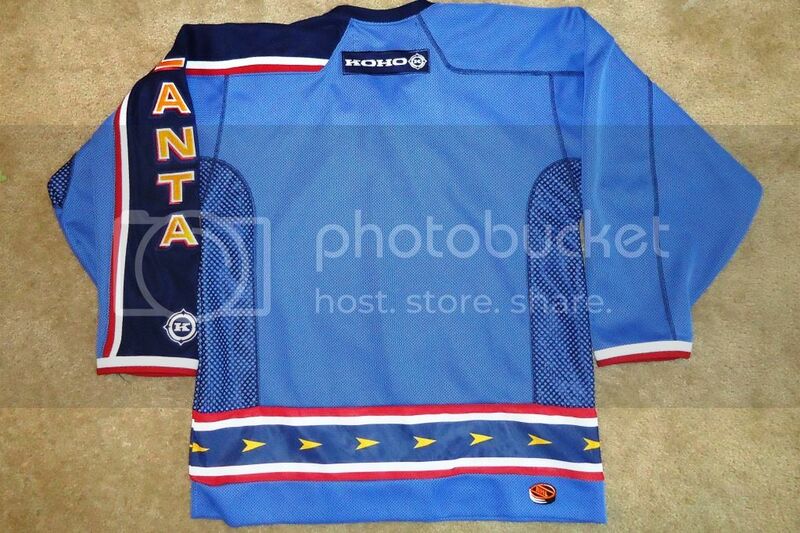 It's got the original Thrashers crest on the front of the jersey set atop a nice powder blue background. Another thing I love about it is the lace up collar. Since this is not a player specific jersey, the back is a bit more boring than usual. Despite that, there are still a couple of cool features on this one. First, I love the addition of the mesh under the arms on both sided. Then there is the cool way in which they used the darker blue thread outlining the different sections of material. Finally, as with the other Thrashers jerseys, I love the trim around the waist area with the continuous band of yellow arrows inside the white/maroon trim. Time to show off a card that features one of my favorite jerseys of all time. 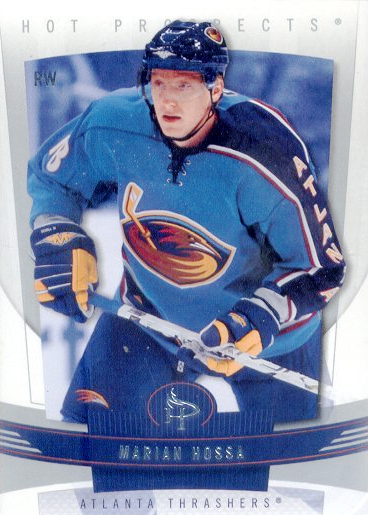 Since this one is not player specific, it was pretty easy to just look for any Thrashers card from the right time period. 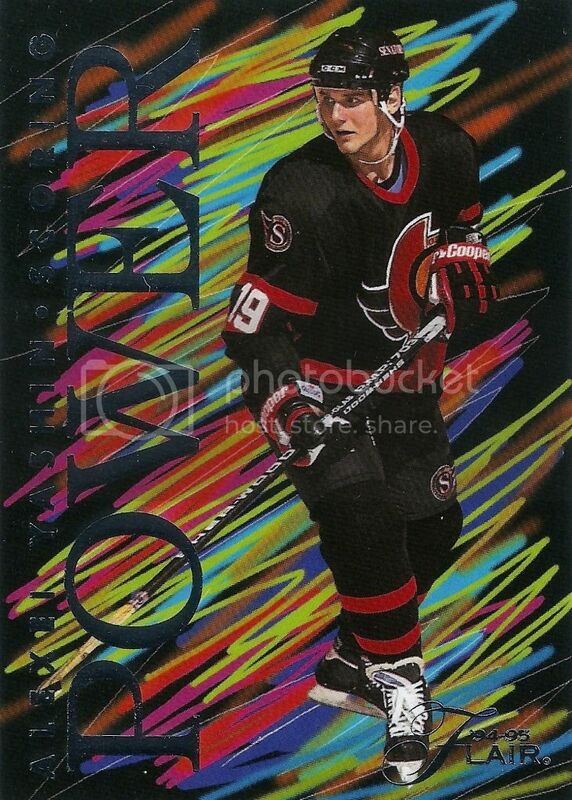 I ended up finding this card featuring former Red Wing and Thrasher Marian Hossa. This is actually only one of three Thrashers jerseys I bought on eBay in the last two months. I'll get to the other two next in this series, hopefully. Not sure when that will be though. Too bad Reebok had to take over the NHL and completely ruin everything I loved about this and the other Thrashers jerseys. Anyone else feel that way about them or any other team? That's right, Jeff Beukeboom, for no other reason than he is the guy on the front of another 90's insert from the dime box at the last card show I was at. 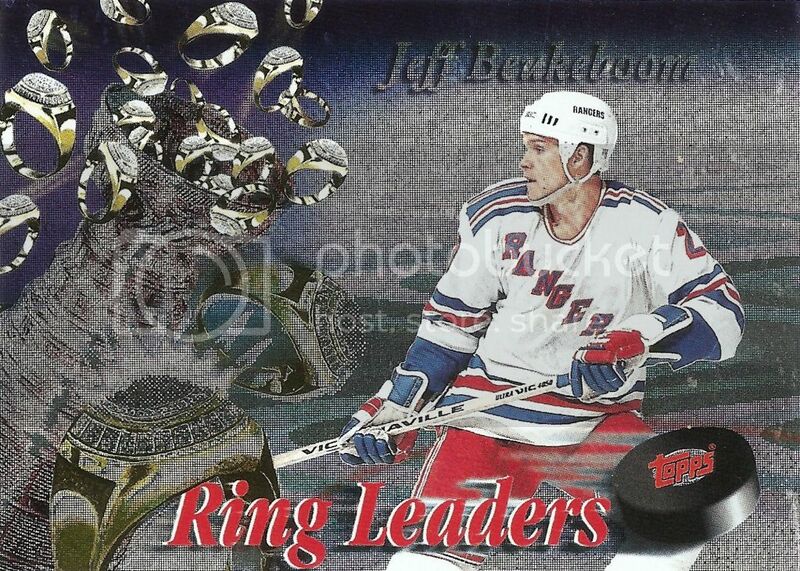 It comes from an insert set that I had never heard of or seen before: 1994-95 Finest Ring Leaders. I will say this card looks much better in person. Something happened to it when I re-sized the file after scanning the card. I mean just look at how hard it is to read Beukeboom's name at the top of the card. It's actually got a nice rainbow tint to it. The back of the card lists the years each player won the Cup as well as the teams they played for at the time. In this case, it lists Beukeboom with three Stanley Cups in Edmonton: 1987, 1988, and 1990. It also has his one Cup from New York back in 1994. On the back it also lists the player's stats from the above mentioned Stanley Cup Finals. In the case of Beuleboom, he played in 11 SCF games and had no goals with two assists. I don't normally go for things like the 800 ct. box of mixed Red Wings cards I bought at my last Gibraltar show trip, but hey once in a while you have to change things up and go for this kind of thing, right? I mean what was the worst that could happen? If you don't like lists (who does for any kind of show and tell post), then here's a visual look at all the differnt sets that made up the 800+ cards in the box. We'll start with some good old 1991-92 Score, one of the first sets I remember collecting as a kid. 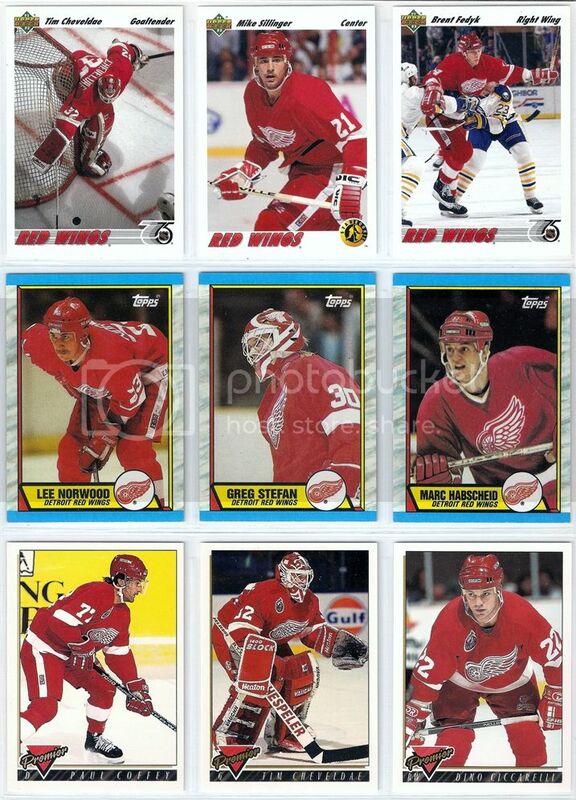 Now we have some 1993-94 Upper Deck, some 92-93 Ultimate Original Six and the original 1990-91 Score. The Sid Able is pretty neat with him dressed up in current (at the time) Wings gear and you have to love the draft day pic on the Primeau. Then there was some 1991-92 Upper Deck, some 1988-89 Topps and 1993-94 Premier. 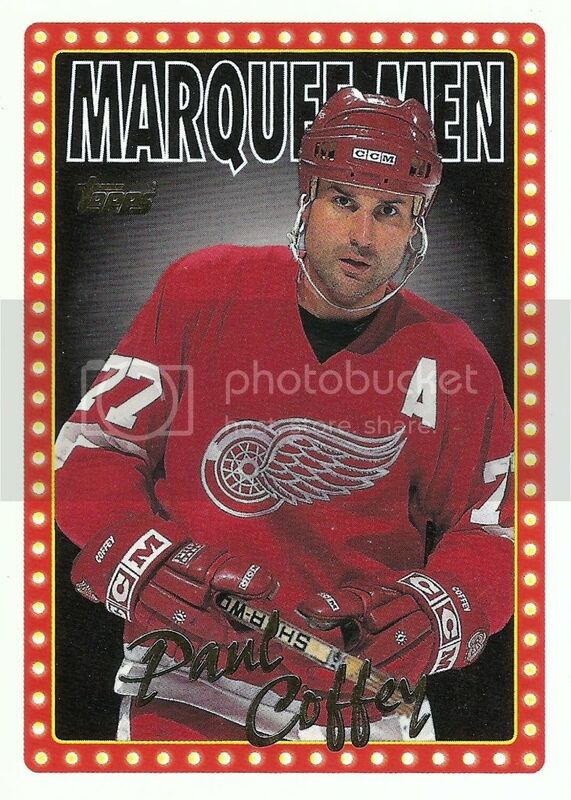 Gotta love the airbrushing on the Marc Habscheid Topps card, I mean talk about an awful looking Red Wings crest on the jersey, am I right? Now we have some Pinnacle, Score, and the original Upper Deck from 1990-91. 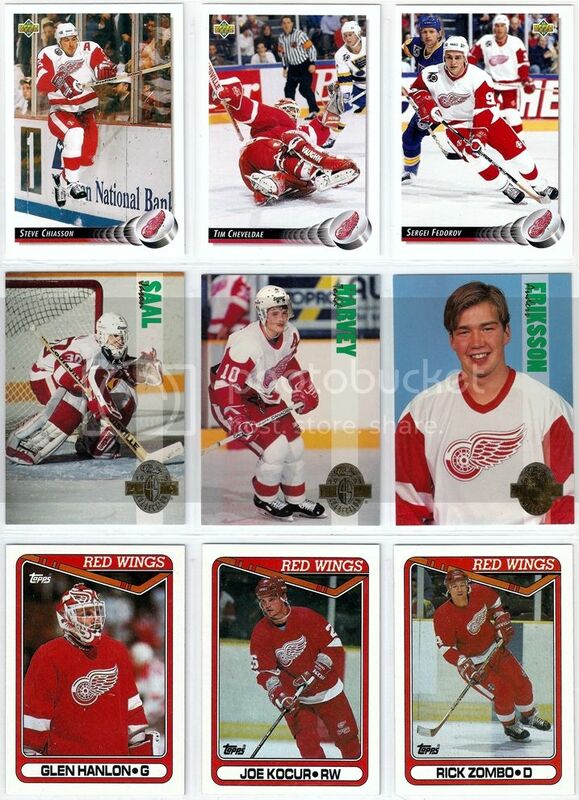 It's weird seeing the late Brad McCrimmon playing for the Wings on the Score card, as I'm only used to seeing him behind the bench from his time under Mike Babcock. Then there was some Topps Stadium Club, O-Pee-Chee, and some Leaf goodness. 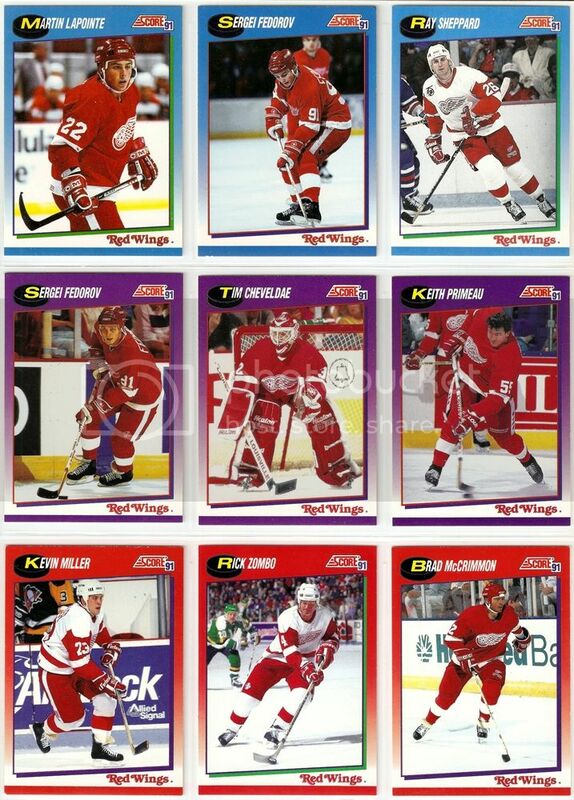 Other than Ysebaert and Crossman, the rest of the guys are the ones who I kind of grew up watching as a Wings fan in the early 90's. Now its time for some more Topps, Score, and a little bit of Bowman. 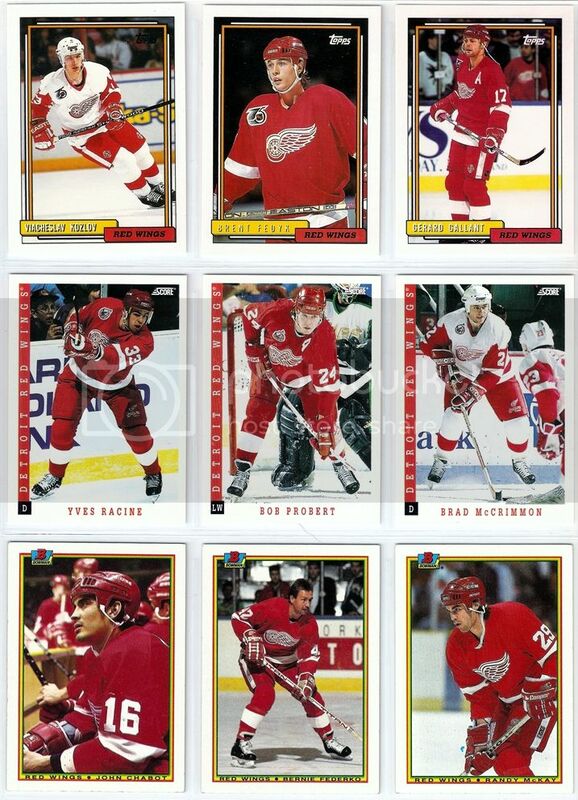 While I know of all the guys pictured among these nice cards, Probert and Kozlov are probably the most familiar to me out of this group. Then there was some more from 1992-93 Upper Deck and 1990-91 Topps. 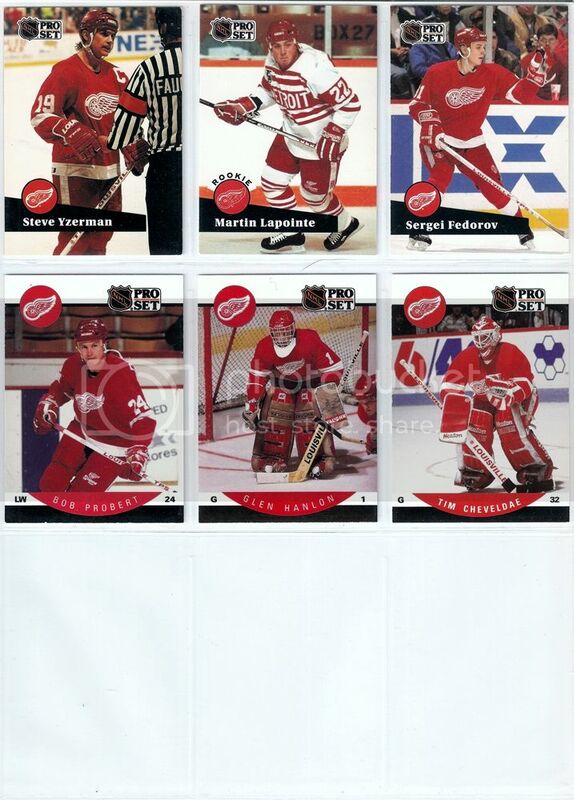 There was also some 1993 Classic Four Sport cards of some Wings prospects, most of which I had never heard of other than Anders Eriksson. I also found a bunch of good stuff from 1993-94 Fleer Ultra, 1991-92 OPC Premier and 1991-92 Parkhurst. Of this group I really like the OPC Premier, especially the Cheveldae, because of the old school third jersey the Wings had back then. Finally, for sets I got three cards or more from, there was some 1991-92 and 1990-91 Pro Set. If I had to choose between the two, I would give the edge to the 1990-91, despite the countless errors that are scattered throughout the set. Definitely a nice mix so far. I saved the best for last as I managed to get a trio of really old (at least to me) cards from the 1980's. My favorite is probably the Reed Larson from 1979-80 OPC as that is one of the best base card designs from that time period. Hopefully that was a good look back in time for you like it was for me. I grew up on these kinds of sets and its always fun seeing them again. Even though they are completely worthless to most, these cards now have a home in my Red Wings PC and they won't be going anywhere any time soon. What do you guys think? Was all of this worth the $6 that it cost me? Its been well over a month now since I added anything to my Howard collection, so my latest eBay pickup was a welcome addition. Its taken me this long now because I've only been looking for great deals and steals on eBay. By that I mean winning an auction for $1 with a few bucks for shipping. The way I see it is I have all the time in the world to go after Howard stuff, so I've been focusing more on my set projects instead. With that being the case, I still do search for Howard's on eBay just as often and I happen to get lucky with this one. I ended up getting it for just $0.99 plus $1.27 for shipping. The card is a gold status die-cut from 2011-12 Donruss Elite, and it numbered to just 99 copies. Once cool thing about this one is that it adds another country to the list of where my PC cards have come from, and that would be France. I didn't read the listing close enough and just thought it was coming from a city in Quebec. No wonder it took so long to get to me. 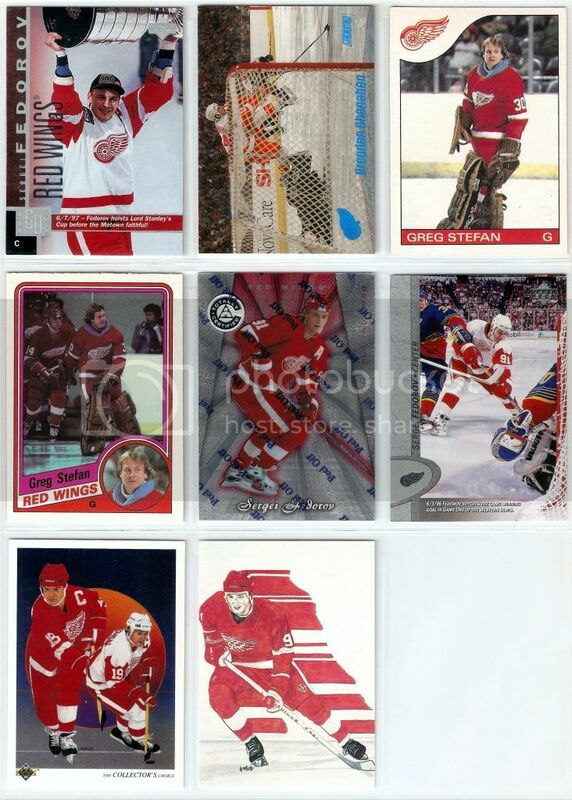 Among the many Red Wings cards I grabbed from the dime box at the last Gibraltar show, I also found a few neat inserts from the 90's that I just had to share here as some more of my picks. While there was a lot of pure crap that came out in the 90's, some of the insert sets were pretty neat. At least that's what I thought as a kid back then. Now it's just kind of fun to look at some of the ridiculous designs from back in the day. Case in point, this one from 1994-95 Flair featuring Alexei Yashin. It's part of the Scoring Power insert set, featuring some of the league's premier scorers from back in the day. Kind of looks like they let a two year old scribble with some markers and used that as the background for their design. Who knows, maybe they were going for some kind of artsy look to them. Whatever they were trying to do, it did not turn out all that well, am I right? Click here to see a few more cards from this set if you're interested. I will say that before picking this card out of the dime box, I had never seen or heard of this insert set from 1994-95 Flair. And for just $0.10, I bought it just to show off here. One of my favorite things to do lately at card shows is look through any dime and quarter boxes I can find. You never know what you'll find and it's always cool to get a look at sets you've never even seen before, even if you don't need them for your collection. At the Gibraltar show over the weekend I found a table where the guy was trying to dump most of what he had by putting out four 5000 ct. monster boxes of $0.10 cards. In there I found all kinds of great stuff. Most of it was 90's junk, but it was neat to see some of the base and insert designs from that time. Definitely a nice mix there. The Lidstrom is pretty cool with the Swedish flag as the background. One of my favorites is the Shanahan Starquest insert from UD Choice. I have always loved these inserts for some reason. 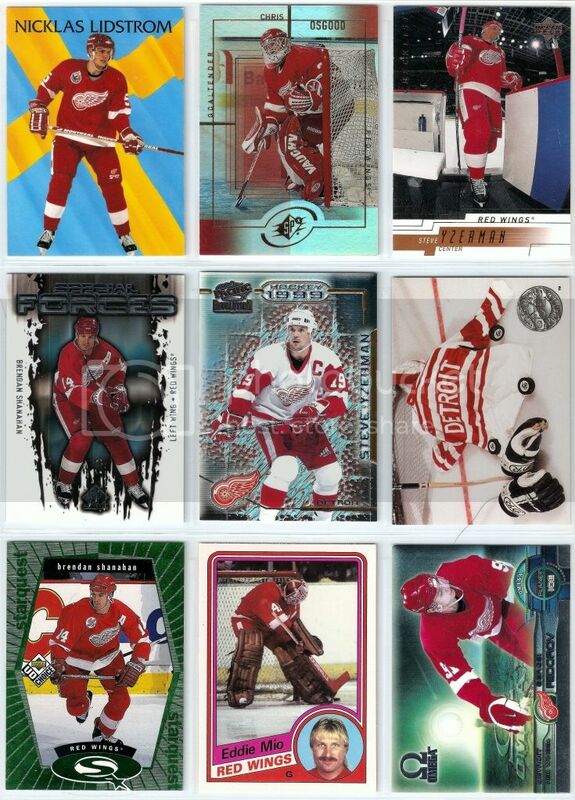 My favorite and the surprise of this bunch was the Fedorov Pinnacle Certified platinum red card. At a show like this in metro Detroit, a card like that would normally be in the dollar box if not marked for even more. Other than that the Shanahan Stadium Club is pretty sweet with the action shot of him leaping over the Flyers goalie. Not bad for just $1.70, right? I'll have to try and get stuff like this more often when I go to shows because it's cheap and it helps give my Red Wings collection a bit of variety. Plus I get to post something here about it, so its a win-win no matter what. As was the case with my previous trips to the Gibraltar show, I managed to find a few nice pieces for this project. I found eight new cards from several different tables at the show. The cheapest was $0.25 and the most expensive was $1.00, so not all that expensive. 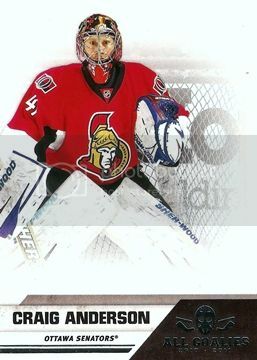 The first one I found was this Johan Hedberg from the 2001-02 MVP Masked Men set. 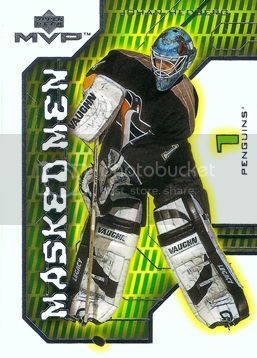 It's similar to the other Hedberg's I have in that it features his original blue "Moose" mask clashing with the black, white, and yellow of the Penguins uniforms. 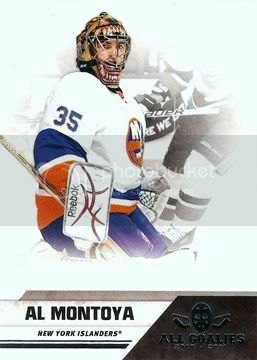 The next one is this Al Montoya from the Panini All Goalies set. It's got the same mismatch as the last Montoya card I grabbed for this project. The mask is the obvious one, but if you look close you can see the maroon in his blocker. 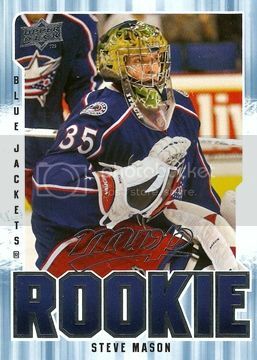 Then there was this one featuring former Atlanta Thrashers goaltender Kari Lehtonen. It's from 2003-04 Topps and is one of his rookie cards, which is stamped right on the card. While his pads match, you can see the Chicago Wolves logo on the side of his mask, which is more than enough for this one to make the cut. The next one is a guy I had never heard of before seeing this card. It features Martin Houle of the Philadelphia Flyers. 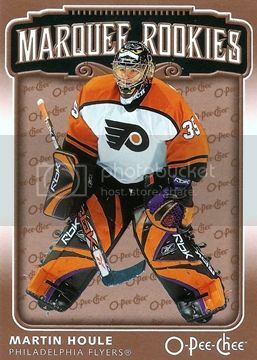 While he has the orange and black going with his equipment, you can clearly see the clash between the Phantoms purple and the Flyer colors. Then there was this one featuring Steve Mason of the Columbus Blue Jackets. It's one of his many rookie cards, specifically from 2008-09 MVP. It's got an obvious mismatch between his green mask and the red, white and blue of the Blue Jackets uniforms. Here we have another repeat offender in Craig Anderson of the Ottawa Senators. He is pictured here playing for the Sens with a hint of Colorado Avalanche in there. Even though he has an updated mask, the rest of his equipment still has the Avs colors. 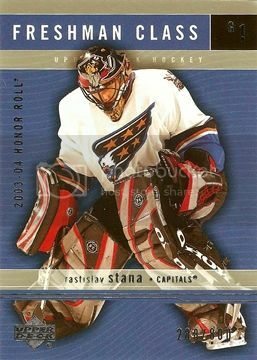 Next is another repeat offender in Rostislav Stana of the Washington Capitals. Here he is once again pictured with black, white, and red equipment from his time with the Portland Pirates. Before today, I had never seen a card from this set, so that's kind of neat. Last but not least we have another Jim Carey for the collection. He is pictured here in the same style Capitals uniform as Stana, but with equipment matching the old colors of the Caps and Pirates, which are of course the red and white. That's it for another productive day at the card show for this project. On the plus side, I can now say that I have reached the 100 mark for this project. I'm actually kind of surprised how quickly I got here and how many of these cards are actually out there. Among the many dime box pickups from my last Gibraltar show was this gem for my Captured on Cardboard side project. I actually had this card in my hand at the last show, but decided not to get it for some reason. Not sure why, but at least I have it now, right? It's hard to get an exact read on the puck in the video, but it looks like the shot on the card was taken around the 0:11 mark. There's an almost dead-on perfect copy of the picture at around the 3:54 mark if you want to watch that far.